Phase II of San Francisco’s Central Subway — which will extend the T-third Muni line from SOMA to Chinatown and the Financial District — is fully underway, and grumblings about the project’s cost and disruption are now so familiar that they fade into background noise. Maybe the time has finally come to evaluate the project for the engineering marvel that it is, one happening largely out of sight beneath some of the most densely occupied and valuable real estate in San Francisco. A racing pair of boring machines — Tremors-like earth-eaters two stories high and as long as a football field — have steadily munched their way from SOMA, past Moscone Center and Union Square and through the densest parts of Chinatown. The machines will emerge in just a few weeks in the heart of North Beach, concluding step one in a modern feat of engineering and putting San Francisco closer to joining the ranks of world-class cities with smooth, fast, reliable subway systems. It’s also time to ponder what comes next. What will transit to and from San Francisco’s northeast neighborhoods — the Financial District, Fisherman’s Wharf, North Beach and Russian Hill — look like after Phase II is completed in 2019? Do we maintain redundant routes above and below ground or face reduced transit options for these dense and heavily visited neighborhoods? 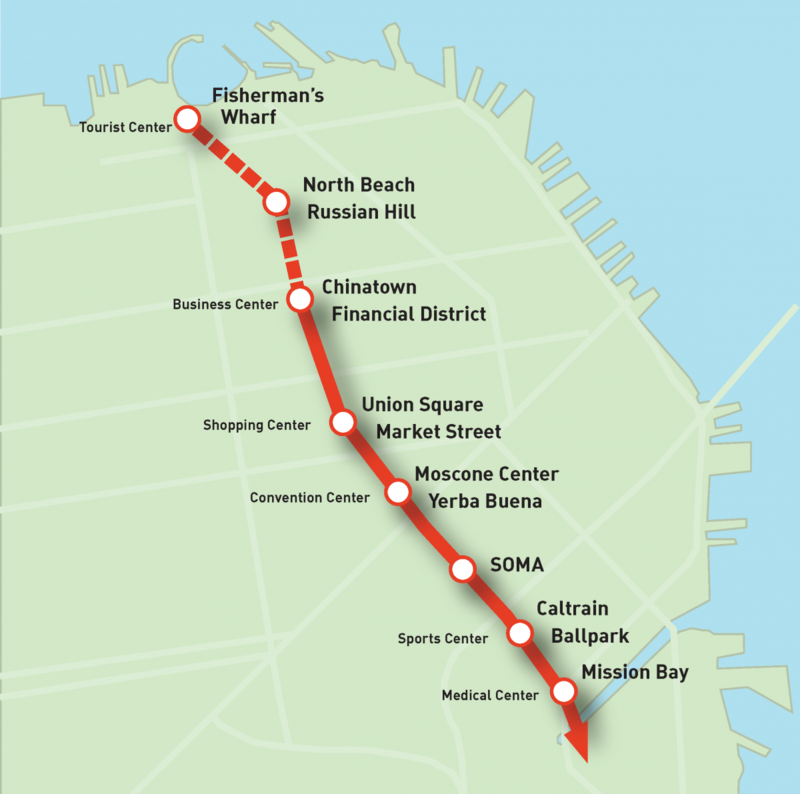 How do we finish the job we’ve started and complete the subway to North Beach and Fisherman’s Wharf? 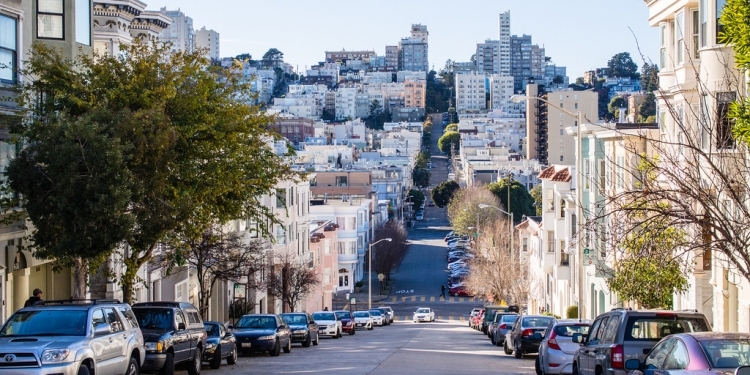 San Francisco was born on its eastern waterfront, and to this day the city’s residential population, business and commercial centers, and transit hubs are concentrated on its eastern side. The T Line (which runs above ground to SOMA and will be a subway north of there) will connect San Francisco’s fastest growing neighborhoods in Bayview, Mission Bay and SOMA; its new medical and research centers at Mission Bay; sports centers for the Giants and Warriors; transit hubs for Caltrain, BART and Muni; the business centers in SOMA and the Financial District; convention activities at Moscone Center; shopping at Union Square and the dense populations and tourist attractions in Chinatown. Continuing that run to include North Beach/Russian Hill (with residential densities of 35,000 to 76,000 people per square mile) and Fisherman’s Wharf (with 7,400 workers and as many as 80,000 tourists per day) makes so much sense that the biggest challenge subway extension advocates face has been convincing people it isn’t already happening. But as of last year, completion of the subway to North Beach and Fisherman’s Wharf did not appear as a wish list line item in projections from the San Francisco Metropolitan Transportation Authority or the Mayor’s Office of Transportation. The San Francisco County Transportation Authority’s long-range documents lumped it in with “other projects” of vague status. The circular reasoning was that the project had not been adequately evaluated because it was not a defined project — but it was not a defined project because it had not been adequately evaluated. That situation is being remedied currently, with a joint SFCTA-SFMTA-Planning Department study of the extension, due to be completed this summer. The hope is that the analysis of costs and benefits will provide the extension with the data needed to position the project fairly in the long queue of potential city and regional transit projects. Preliminary projections show the increase in projected ridership for an extended subway would be exceptionally high compared to other projects — important in a federal funding climate where emphasis has shifted from time saved to number of trips made. The extension would allow the current subway project to fulfill its promises of high ridership numbers and reduced surface congestion. Imagine downtown workers zipping up to North Beach for dinner, regional visitors in town for a carless day of sightseeing, Moscone conventioneers linked to Fisherman’s Wharf hotels and meeting rooms, wharf area workers no longer competing for seats on the F Line, and all of us enjoying better access and reduced travel times while the northeast neighborhood streets offer a calmer pedestrian realm. Back in today’s North Beach, SFMTA is finalizing preparation for the extraction of the boring machines on the site of the old Pagoda Theater across from Washington Square. It’s a unique location: centrally located, right across from Washington Square and highly visible. It’s also an unusually large site for the neighborhood, which means it could provide access for construction of an underground T Line station, minimizing surface disruptions to Columbus Avenue, and then become the perfect site for a ground-floor subway entrance with, say, housing above. Currently the site is scheduled to be returned to its owner next year for the construction of condos. With that transfer, the city would lose a major opportunity to provide adequate public transportation to some of its most highly trafficked neighborhoods and to finish the job we’ve started. Julie Christensen is a member of SPUR’s Advisory Board and a founder of SFNexTstop.